You don't bring back a name like Big Bertha unless you've got something really new & exciting. Adjustable weights, adjustable lofts, adjustable face angle — it's all been done before. But an adjustable center of gravity? Now that fits the bill. 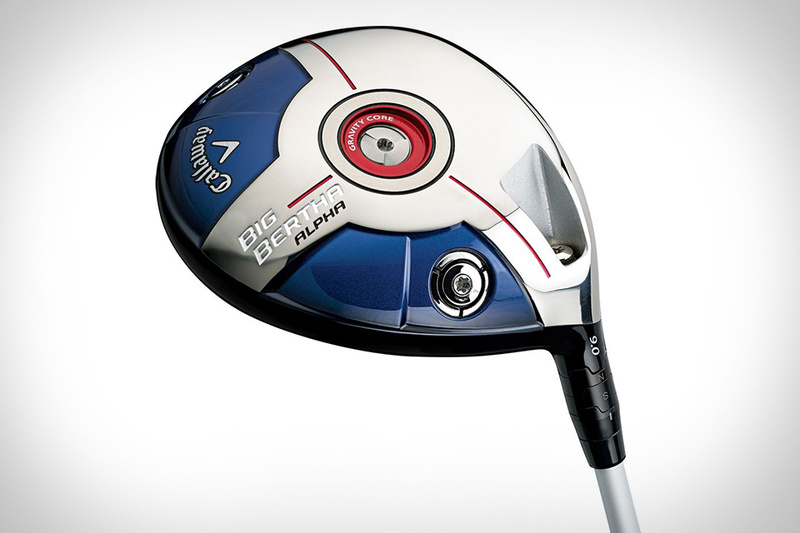 And that's exactly what you'll find on the Callaway Big Bertha Alpha Driver. Like most adjustable drivers, the Alpha offers an adjustable hosel for for changing the loft and face angle, and movable weights for further launch adjustment, but adds a Gravity Core that allows you change the vertical center of gravity independently of everything else — giving you yet another way to custom-fit the driver to match your swing. It's easy to go out and buy a ping pong table. But it's not easy to find one that doesn't look like a playing surface slapped on top of a metal box. The Killerspin SVR Black Ping Pong Table is not a surface on a box. Offering tournament-level performance, this top-tier table features a playing surface made from 22 millimeter medium density fiberboard for a consistent bounce and with a Repeat Roller Coating for minimal glare. There's an Apex net and steel post system, but perhaps the most notable feature is the base — a 2.5-inch thick arched silver metal frame that will look fantastic no matter where you place it. Why should people doing work get all the EDC attention? Now boarders have their own permanent accessory with the Leatherman Hail Snowboard Tool. Designed in collaboration with Signal Snowboards, this TSA-compliant pocketable tool features needlenose pliers, standard pliers, wire cutters, both flat and Phillips screwdrivers, tweezers, a scraper, a lacing assistant, a nail file, a carabiner, a 10mm wrench, and, of course, a bottle opener. Don't hit the slopes this winter in just any old garb — make sure your style matches your shredding abilities by donning some Isaora x Quiksilver Rare Earth Snowboarding Gear. A collaboration between Isadora and Quiksilver, this exclusive lineup includes a matching base layer, jacket, pants, and bag produced by French studio Jonathan & Fletcher using advanced materials sourced from European mills, as well as a board and goggles to go with them. Even if you're a novice, at least you'll look good while repeatedly eating snow. Don't dare call it a ping pong paddle — this is one serious table tennis racket, not meant for the casual table gamer. The Killerspin Stilo7 SVR Ping Pong Paddle ($350) features wood construction at its base, which is then coated in layers of carbon fiber, making it one of the nimblest, lightest table tennis rackets out there — while the rubber coating on each side gives it the kind of performance and speed you expect from an elite racket. It comes in a felt-lined, piano-finished box made just for the paddle, so it cradles it perfectly when it's not in use. There are table games, and then there are status symbols — and the Eleven Ravens Stealth Ping Pong Table ($70,000) sits somewhere on that spectrum closer to a status symbol. Limited to just five units, this special edition ping pong table is sure to start a few conversations (and probably encourage a touch of jealousy). Inspired by the Nighthawk Stealth Bomber, and made entirely from aircraft grade aluminum with carbon fiber accents, each of the five tables comes numbered and signed by the artist who crafted them. And with details like hidden drawers that perfectly hold your paddles and balls, the design serves form as well as function. As part of their 2013 athletics collection, the Killspencer Speed Bag features all the American-made craftsmanship you expect out of a Killspencer product, in the form of a well-made boxing accessory. Perfect for staying fast, strong, and sharp — or just looking great in your apartment — this speed bag features high-quality workmanship, with stitched black leather construction, a welded black steel pyramid frame, and a walnut ply disk platform. So, even if you don't use it to keep yourself looking great over the winter months, you can at least rest assured that it'll make your space look better.